In this series of articles I will examine several players who – over past few seasons – have shown a quite clear downward trend in their production. I will speculate whether the upcoming season will be the continuation of the trend or perhaps a reversal. Blake is 28 years old, which – for a modern NBA player – is the time when he should be on top of his powers and wreaking havoc in the league. Instead, we can see an obvious downward trend and average value of his production had dropped significantly over last 4 season. How big is the drop? He was ranked in Top20 in 2014-15, and just outside Top60 last year. So what happened? Several things, but let’s start with injuries. Over last 4 seasons Blake missed the following number of games – 15-47-21-24. Early in his career he was dealing with broken left kneecap (patella). Remember the left side as it’s quite important later on. Staph infection in his right elbow in Feb 2015 was a random problem. It did require surgery though. December 2015 – torn left quadriceps tendon. Left side! February 2016 – Blake breaks hand on his trainer’s head. Stupid, immature and completely avoidable injury. Yet – it did take him out for half a season. April 2016 – Blake injures his left quadriceps. Left side again! This injury bears much more significance since it’s another injury to his “motor”. Blake does depend a lot on his athleticism. December 2016 – right knee requires surgery which takes him out for 3 months. It’s the other side of the body, but it is not uncommon for players to suffer compensatory type of injury. Blake might (even unconsciously) have favored his left side – which lead to overburden to his right leg and subsequent injury to the right knee. April 2017 – right big toe injury and surgery. Rather random injury. November 2017 – left MCL sprain, 15 game absence followed by trade to Detroit Pistons. So you can see that Blake has suffered several leg injuries. Those same legs which made him fly above the rim in his first few years in the league… Patella-quadriceps tendon-quadriceps muscle are part on the same structure playing a role in straightening of the leg from bent position. Much like in jumping… Blake injured each of them along the way. This leads to very possible reason in his loss of value – Blake does not fly any more. Prior to season 2014-15 Blake attempted to dunk on 14-21% of his shots. That is a lot. Why he did that? The simplest answer is – because he could. Why settle on threes (especially if you cannot shoot them) if you can jump over people and dunk with 80% efficiency. Since then? His dunk attempt rate significantly decreased and is at around 5% now. Why? Because he cannot do that any longer. Would you like another stat related to athleticism? Offensive rebounds. 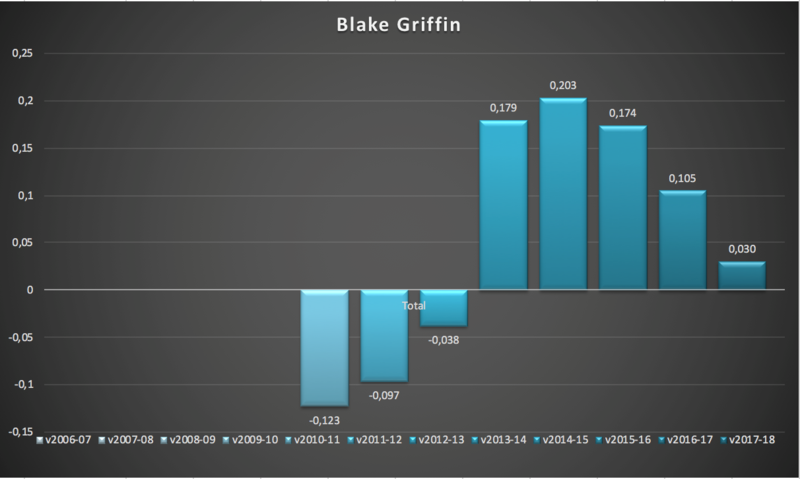 First 4 seasons – Blake averaged between 2.3 and 3.3 ORebs per game. Since then? A steady decline from 1.9 in 14-15 to just barely over 1.1 last season in Detroit. Yes – Drummond is a rebounding machine living off the glass but he’s not that much different from DeAndre Jordan. Sure – we can say that OReb also correlate with offensive role and the further away from the basket you play – the fewer OReb opportunities you will have. Blake does operate far from the basket. But he actually always did. The difference is – when he was athletic – he would just fly by the defender, collect, jump off both feet and slam the ball. Now (since his jumping ability is largely gone) he has to settle for jumpers and threes much more often. So in Blake’s case it is not evolution of his game to become a stretch PF, but a mere necessity in order to remain relevant due to his much poorer athletic ability. Please note that I do not consider videos with highlights as a very subjective measure of player’s abilities, but are just a different type of argument. In order to summarize this hate-post (as it will undoubtedly be labelled by Blake’s fans) a word of advice – do not get your hopes up that “early” Blake will ever come back. He may still be a 20pts, 7 reb, 6 ast guy, which for PF is a very nice haul. But that is not enough to get him back anywhere near Top20. There are two (both unlikely) ways for him to become more than he was last year. Either he becomes an elite sniper from beyond the arc who makes 3.5-4 3pm while increasing his overall FG% or for some reason he becomes a good defender. You decide which is more likely, but to me chances are very low for either.